The last two decades have made way for a growing body of research supporting the use of mindfulness-based interventions to decrease stress, anxiety and depression, reduce inflammation, boost the immune system and improve sleep among other things. More recently, modified versions of mindfulness protocols have been implemented everywhere from corporate workplace settings, to classrooms, to the criminal justice system. Perhaps the most universal application of mindfulness has been in the realm of physical activity. Indeed, in the same way that most people can benefit from becoming more mindful—paying greater attention in the present—so too does aerobic exercise offer a whole host of health benefits. As such, combining the two makes sense. That’s how the idea of “mindful movement” took hold. I’ve been following this research for some time because it is something I have long subscribed to in my own training. Rather than throwing on a pair of headphones and tuning out discomfort or allowing my mind to subconsciously circulate thoughts and emotions, I have found that the running experience is enhanced in almost every way when I apply the principles of mindfulness to my training. 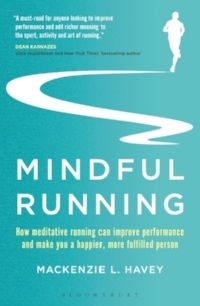 In conducting countless interviews and research for my forthcoming book, Mindful Running (October 2017, Bloomsbury Publishing), I’ve become increasingly convinced that running in a more mindful state not only has the potential to improve physical performance, but also increase the joy a runner garners from the training process. Don’t take my word for it, though. Check out some of the fascinating new research that is showing how the powers of mindfulness can make you a happier and healthier runner and human being. 1. Mindfulness teaches you how to listen to your body: Paying attention to your body’s cues is essential for elite runners and weekend warriors alike. The mindfulness literature suggests that conscious awareness of the body as it moves can help you regulate decisions related to effort, pace, nutrition and other elements involved in training and racing. By learning to respond in the moment to a hunger pang in the middle of a marathon or your body’s call to adjust your pace in response to a particularly hot or humid day is important. What’s more, it can also clue you into the need to back off when you’re approaching the point of injury or overtraining. Rather than blindly following a predetermined training plan, mindfulness assists you in recognizing circumstances in the moment so you can adjust accordingly. 2. Mindfulness can reduce running-related anxiety: Whether you’re an elite runner or training for your first 5K, we’ve all fallen into the trap of being self-critical. It could be about a poor workout, a missed opportunity in a race, or the struggle to lose weight. Research published in the Journal of Clinical Sport Psychology discovered that offering runners just four weeks of mindfulness training helped to reduce sport-related worries. Since harriers often lean towards perfectionism, learning to engage in what is directly in front of you, instead of in the past or future, can go a long way toward calming self-created anxieties and judgments. 3. Mindfulness can help you deal with suffering in a constructive way: There’s no getting around the fact that running involves some discomfort. While you should certainly stop running if you think you might be injured or experiencing a medical issue, learning to live with discomfort is part of the game if you want to improve as a runner. While much of the research on mindfulness and pain involve participants who suffer from chronic pain, the idea is similar in other areas, such as in the case of exercise and physical training. The most recent studies suggest that the focused attention that is promoted via mindfulness assists in pain relief. When left unchecked, our brains tend to exaggerate and catastrophize to no end, but the evidence points to the fact that when we acknowledge the physical suffering involved in charging up a hill or pushing through the final stretch of a race, we are likely to discover that it isn’t as bad as we may have thought. 4. Mindfulness can make you a more joyful athlete: For the past several years, researchers at Rutgers University have been working to test the combination of mental and physical training in the clinical setting. Dubbed “MAP Training” (Mental and Physical), they have discovered that combining seated and walking meditation with aerobic exercise dramatically decreases depressive thoughts. Setting the stage to be a more mindful runner by meditating for a few minutes before you hit the road may be just the thing you need to enhance your mood and put you on a happier path both on and off the running trails. 5. Mindfulness can aid you make better tactical decisions: Research published in the Journal of Clinical Sport Psychology that examined the application of mindfulness to competitive sport demonstrated that present-moment awareness can give an athlete better attentional control. This means that mindfulness can train your brain to dole out cognitive resources more efficiently. This is a key skill to have in the racing environment because it allows you to fully focus on whether and when you should make a strategic move around a competitor or regulate your pace or effort in response to changing conditions. 6. Mindfulness helps you enter flow: A significant relationship between mindfulness and flow has been demonstrated in a number of academic studies. When you enter the flow state, also known as getting “in the zone,” you feel and run at your best. It’s when you’re running hard, but it almost feels effortless. A study published in the Journal of Clinical Sport Psychology shows that just a month of mindfulness training can help athletes more readily access that magical headspace—the place peak performance lives.